Below will be held by UPSC and Candidates can download their e‐ Admission Certificate/ e‐ Admit Card from the UPSC website / COMMISSION'S WEBSITE (www.upsc.gov.in) before three weeks of the Written examination, and also Candidates can get details for examination (Conventional Type Tests and Objective Type Tests) as well as information about registration of Their applications, venue of the examination and results etc. There will be negative marking based on multiple choice question – Paper, for each wrong answer one third (0.33) marks will be deduced. All eligible candidates can fill this online application . Indian Railway Service of Signal Engineers (I.R.S.S.E.). Indian Railway Stores Service (I.R.S.S.) (Civil Engineering Posts). Indian Railway Stores Service (I.R.S.S.) (Mechanical Engineering Posts). Indian Railway Stores Service (I.R.S.S.) (Electrical Engineering Posts). Indian Railway Stores Service (I.R.S.S.) (Telecommunication/Electronics Engineering). Indian Ordnance Factories Service (I.O.F.S. )AWM/JTS (Mechanical Engineering Posts). Indian Ordnance Factories Service (I.O.F.S.) AWM/JTS (Electrical Engineering Posts). Central Engineering Service (Roads), Gr ‘A’ (Civil Engineering Posts). Indian Inspection Service (IIS)(Asstt. Dir. Grade I). Indian Telecommunication Service, Group ‘A’. Central Engineering Service (Roads), Gr ‘A’ (Mechanical Engineering Posts). Indian Supply Service Gr ‘A’. AEE (Electrical) of P&T Building Works Gr ‘A’. Indian Ordnance Factories Service (I.O.F.S.) AWM/JTS (Electronics and Telecommunication Engineering Posts). AEE(Civil Engg Posts)in Border Roads Engineering Service Gr ‘A’. AEE(Mech Engg Posts) in Border Roads Engineering Service Gr ‘A’. AEE(Civil) of P&T Building Works Gr ‘A’. Junior Telecom Officer (General Central Service Group ‘B’ Non‐Ministerial). Central Power Engineering Service Group ‘B’ (Electronics and Telecommunication Engineering). Eligibility Criteria for the recruitment of Indian Railways: Candidates age should be in between 21 years to 30 years and age limit should be according to the date 1st January, 2017. Candidates must have degree of Engineering with the disciplines like Civil, mechanical, electrical and Electronics and Telecommunication Engineering. Candidates must have M.Sc. degree or its equivalent with the streams like Wireless Communication, Electronics, Radio Physics or Radio Engineering as a special subject. Candidates pass Graduate Membership Examination of the Institution of Electronics and Radio Engineers. Examination Centers/venue : AGARTALA, AHMEDABAD, AIZAWL, ALIGARH, ALLAHABAD, BANGALORE, BAREILLY, BHOPAL, CHANDIGARH, CHENNAI, CUTTACK, DEHRADUN, DELHI, DHARWAD, DISPUR, GANGTOK, HYDERABAD, IMPHAL, ITANAGAR, JAIPUR, JAMMU, JORHAT, KOCHI (COCHIN), KOHIMA, KOLKATA, LUCKNOW,MADURAI, MUMBAI, NAGPUR, PANAJI (GOA), PATNA, PORT BLAIR, RAIPUR, RANCHI, SAMBALPUR, SHILLONG, SHIMLA, SRINAGAR, THIRUVANANTHAPURAM, TIRUPATI, UDAIPUR AND VISHAKHAPATNAM. Selection Procedure/ process for admission to Engineering Services Examination - 2018: Recruitment Process will be based on three stages medical examination, written exam and Interview / Personality test. Written Examination for Engineering Services Examination – 2019 (ESE-2019)- will contain two sections. Syllabus for both Sections will be based on engineering courses like Civil Engineering, Mechanical Engineering, Electrical Engineering and Electronics and Telecommunications Engineering. Interview / Personality test- After qualifying the written examination candidates are able to face Interview or Personality test, for which Maximum marks will be 200. Syllabus, Written Examination Question- Paper Pattern and Type: Written exam will contain two sections, 1st one of objective type and 2nd section will be of conventional type, for which total marks will be 1000. There will be negative marking also. General Ability Test (General English and General Studies) for 2hours and 200 Maximum Marks. Engineering Paper‐I for 2hours and maximum marks 200. Paper‐II for 2 hours and 200 maximum marks. Engineering Paper‐II for 2hours and maximum marks 200. Civil Engineering Paper‐I for 3 hours and 200 maximum marks. Paper‐I for 3 hours and 200 maximum marks. Engineering Paper‐I for 3 hours and maximum marks 200. Civil Engineering Paper‐II for 3 hours and 200 maximum marks. Paper‐II for 3 hours and 200 maximum marks. Engineering Paper‐II for 3 hours and maximum marks 200. Candidates can fill this online application form through commission’s website, which is www.upsconline.nic.in. Candidates can download their e- admission certificates before three weeks of the examination from UPSC website (www.upsc.gov.in). Candidates can select their engineering discipline and centre for exam. 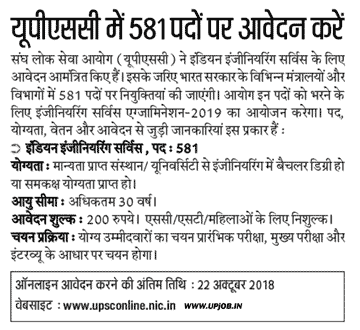 Candidates can solve their problem regarding this online application form through upsc website as well as by using the contact nos. 011‐23385271, 011‐23381125 and 011‐ 23098543. Examination Fee and Mode of Payment: There will be no fee for Female/SC/ST/ PH candidates. And candidates can pay the fee by both modes that is online and offline. Rs 200/- is the fee for General and OBC category candidates.